It appears that the download link in the original post has been dead for a while. I am providing two additional links. MegaStat® is a full featured statistical add-in for Excel. 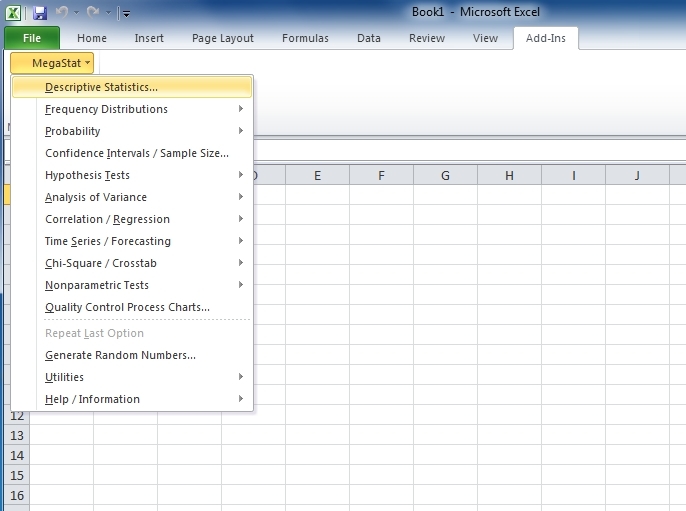 This guide will help you setup MegaStat package in Excel 2010. 5. Select “Browse“, and Select the .xla file you’ve just downloaded. 6. You will see “MegaStat” in the list of Add-ins. Make sure that is selected. 7. Now Excel 2010 shows the MegaStat in the Add-Ins tab. This entry was posted in Academic, Study, App of the Week, Research. Bookmark the permalink. After 3 hours of trying to follow your directions, IT @ the university included, …MegaStat 2003-2007 creates a file called office12 and excel 2010 has a file called office14…when downloading megastat does not fall into the correct file, you have to move megastat to the file office14 for it to work….after it is working—-there are overload messages and missing componets ….Megastat 2003-2007, does’t work well in exel 2010 at all. I can only do certain parts of my homework in stats class…….. Followed the directions and Megastat does not appear as an option to be selected under #6. Hi, Dear Maggi, What version of the Excel 2010 are you using? It worked fine on my new computer this time again. Thanks for the help!!! It works perfectly with my excel 2010! It wouldn’t work following the directions my school gave me, but your worked well. Then go to Excel 2010 and check under add-ins and look at top left side to see MegaStat added. Thank you very much. Following the directions I was able to get it to work with no problems. I was having trouble getting this to work in Excel 2010 after installing and this tip worked perfectly. Thanks for including a link to the xla file! Thanks! Needed it it for Graduate-level Stats. Instructions worked great. I have Excel 2010 64-bit and others in my class have Excel 2010 32-bit. Those with the 32-bit version worked fine with the file for Excel 2010 that is available on the University of Phoenix Website for Excel 2010. I could not get the Excel 2010 version to work on my machine using 64-bit Excel so I followed the steps outlined above by Kevin Tugwell and worked like a charm for me. Followed the directions outlined in the article and it worked perfectly. having problems with mega stat in excel 2010. Is is because my system is a 64 bit? Everything I read says its tested on 32 bit. Can’t get all items to work and am getting error messages. Appreciate help, have lab and quiz due in a couple of days. thanks a lot !!! it also work great on MS excel 2007 !!! I am using a 64 bit Windows and Excel. Works fine here. Can you tell me more about your error messages? I have the 64-bit versions of Windows 7 and Excel 2010. I was getting a message that says “Compile error” and something about the coding not being correct. I was on the phone with tech support for over an hour and a half with three programmers and they couldn’t figure it out. My professor sent me a link to your forum post as a last ditch effort. I tried the above instructions with the download version 10.2 release 2.1, I got off of McGraw-Hill, and still got the same error. I was about to give up but I saw a post above that said thanks for including the download link, and so I gave the link in the instructions a shot. Extracted it to the “Office 14” folder, checked the box in the add-ins drop-down under options, and BOOM! it works. Any chance that this will work for Excel for Mac 2011? I’ve been running into some issues so far. Sorry, I haven’t had a chance to run it on the mac. Hey, thanks a lot. For my stat class I needed to add megastat and downloaded it from the link Professor sent out. Even after trying many many times, it was not working. I have been searching all over internet to find suggestion or possible solution and here I found it. I downloaded the megastat from the link posted above and now it appears fine under add-ins tab in excel 2010. Will save this link just in case any of my classmate encounter the same problem. After reading this tip I was able to do it with no problems! Anybody get it to work in Excel 2013? I load it, but the Add-in tab doesn’t even show up. If I double-click the actual megastat.xla when I have a worksheets open the addin appears and I can do what I need to do. Any help would be appreciated. 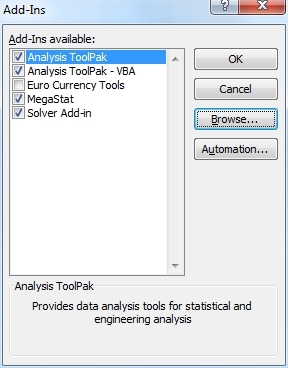 Could you please provide the alternative link to download “MegaStat add-in file” ? Will upload one soon. Thanks for reminding me. I have Excel 2013 64 bit installed. I added the megastat add-in but do not see it show up in the add in ribbon or under the developer ribbon. Any help? It does show up under File/Options/Add-Ins/Go …. Did you check the box? I have Excel 2010 64 bit and have downloaded MegaStat. The add in is check but I am still coming up with an error message. The above states to install 2003 and 2007. What are we installing in addition to MegaStat. Are these Excel programs or versions of MegaStat? I have windows 10 , office 2013 will it work for me?